MONTREAL – October 9, 2014 – Independent game developer Hololabs today announced the launch of its mini-game maker, the mobile app Papercade. Papercade debuts in the spotlight, headlining as an Official Digital Selection at this year’s international game festival IndieCade, October 9-12 in LA. Designed for all ages, free and easy to use, Papercade delivers a new experience to the growing worldwide audience making and sharing games today. Players can create “storygames” from funny to fantastical, from personal to political—and everything in between. Charming sets and a vintage feel form the backdrop for Papercade, where players can place their own heroes, villains and props into the mix. Papercade provides a range of tools and actions to make original storygames and share them with friends. Players can easily customize characters from images of family, friends and pets, placing these cutouts into 3D scrapbook environments. “In designing Papercade, we challenged ourselves to develop a mobile game that brings together the hands-on and nostalgic elements of today’s maker movements with the world’s insatiable appetite for taking and sharing photos,” said Hololabs Co-founder and CTO, Mike Wozniewski. 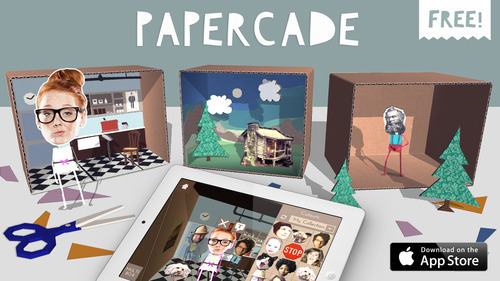 Papercade is available now on the App Store for iPad. Click HERE to download. Watch the Papercade trailer HERE. Hololabs is an award-winning production studio founded by industry veterans Paul Warne and Mike Wozniewski with the aim of developing new technologies to better serve creativity and play. The studio’s latest title Papercade, a mobile app for creating and sharing storygames, was financed in part through the generous support of the Canada Media Fund.